Sat., June 4, 2016, 11:16 p.m. It looked nothing like the last Spokane-Billings meeting. 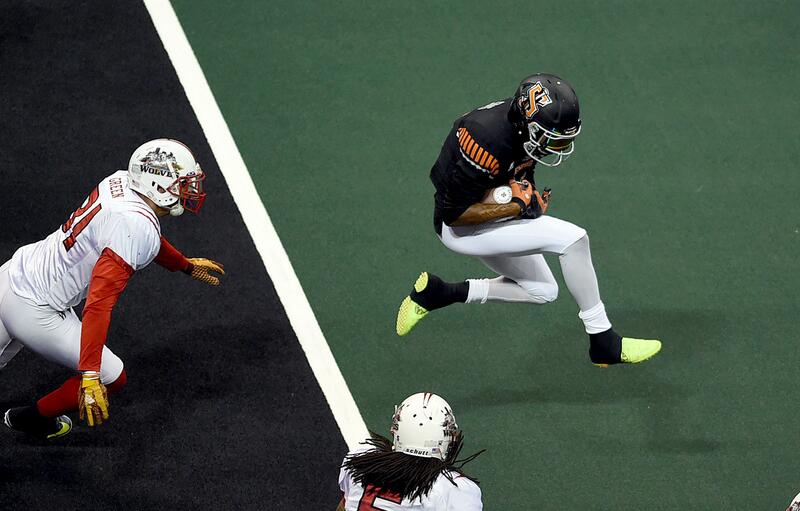 A 47-point blowout last month gave way to a physical, back-and-forth Indoor Football League scrap Saturday night at the Arena. Robert Brown had two second-half interceptions and Spokane squeezed out just enough offense to defeat the Wolves 51-41 in front of 4,154 fans, clinching the No. 1 seed in the Intense Conference. The top seed is big for Spokane (11-2), which is playing 13 consecutive weeks to close out the regular season. The IFL takes a break for the Fourth of July holiday and Spokane will have a first-round playoff bye before hosting the Intense Conference title game. “We just bought ourselves two weeks (of rest),” said coach Adam Shackleford, noting the possibility of a fifth meeting against the Wolves in the conference championship game. Spokane is 2-1 against Billings and the teams also meet in the regular-season finale. An extended break in July could become important healing time for Empire players. The team lost standout running back Trevor Kennedy in the third quarter to a lower-leg injury. Kennedy wasn’t sure of the extent of the injury, but he was helped off the field without putting any weight on his right leg. He was on crutches after the game. “It doesn’t look good,” Shackleford said. Spokane has Andrew Pierce, an All-IFL running back last season, on its roster. He’s on the refused to report list but could be brought in if Kennedy is sidelined for an extended period. Billings (6-7) took a 27-22 lead with 5:34 left in the third quarter and had possession after picking off a Charles Dowdell pass. Brown gave the ball back to Spokane with an interception at the goal line and a nice return to the 22-yard line. Dowdell’s 17-yard touchdown pass to Samuel Charles put Spokane in front 30-27. Brown picked off Wolves’ quarterback Cory Murphy on the ensuing play from scrimmage, again at the goal line and he made another lengthy return. Carl Sims fumbled fighting for extra yardage near the goal line, but JJ Hayes pounced on the ball in the end zone for a touchdown, putting the Empire on top 37-27. The teams traded scores the rest of the way with Josh Ferguson’s 4-yard touchdown reception in the closing seconds sealing the victory. Spokane is 7-0 at home. Dowdell was intercepted twice but had four touchdown passes and ran for another score. Sims had seven catches for 77 yards and Charles had a pair of TD receptions. Murphy accounted for five touchdowns, three rushing and two passing, but he was intercepted three times. The Empire managed just one offensive touchdown in the first half. Billings bottled up Kennedy – five yards on 10 carries – and Spokane drives stalled on downs, a missed field goal and an interception. Billings’ offense gained just 64 total yards on 19 first-half plays. Murphy didn’t complete a pass until 6:45 remained in the second quarter. Dowdell hit Sims for a 6-yard touchdown pass to cap a 13-play drive and put Spokane on top 7-0 late in the first quarter. Billings evened the score on Murphy’s 1-yard touchdown run. Spokane went back on top when Kennedy returned a missed field goal 57 yards for a touchdown, but the Wolves responded with another Murphy touchdown run. Blake Erickson’s PAT was no good and Spokane led 14-13 at the break. Published: June 4, 2016, 11:16 p.m.